Join the discussion on our forums! Come discuss Psychic Scream over in our dedicated Psychic Scream discussion topic. This is even better than Twisting Nether. Yeah it's a pseudo-clear because they get it back in drawing the cards, but that is exactly why it's so good. Priests will just use it to stall so they can OTK. It's disgusting seeing a Priest hang on at 1-5 health and just play Physic Scream in order to win. Not to mention they can put their own minions in your deck that don't help you. On top of that you can discover an extra copy with Shadow visions. With the giant Tempo loss and dead cards in your draws this is better than destroying the board. It doesn't even help you in a fatigue matchup. Not to say Priest would be playing a deck like that currently but if they were, they would just have Archbishop Bendictus to add your deck into theirs. Cards like this just shouldn't exist - you shouldn't be able to wipe a full board of large minions with one card. That goes for Shadowreaper Anduin and Lightbomb as well. What about Twisting Nether and Brawl? Its like Hotform said here https://clips.twitch.tv/BelovedDarlingSeahorseDxCat . The fact it also removes deathrattle minions , and shuffles stuff into your deck (wich gives you more bad topdecks ) while the Priest can set up for their otk, is just so ridiculous. No wonder people only play otk or aggro decks. Cant wait to see this s..t card gone. I'm curious to see how long Blizzard will kite priest with situational board wipes until they release an actual AOE spell ala Lightbomb or Dragon Fire Potion. I think that this card really shines when Priest has some sweepers to play alongside it, but as of right now, it's not as powerful as it could be. I'm not denying that it's powerful and it's effect can be devastating, it's just not really an efficient sweeper right now for Priest in the current meta game. Way overated. Too situational and a dead card in hand in many games. Sure, it can save your day from time to time but I still think other AoE spells are more consistent and reliable in the long run. Battlecry: Shuffle all t h i c c minions into your opponent's d e c c.
Will be interesting to see how this card fairs after the nerf. What so many people complaining about this card need to understand is that it only delays the inevitable. Which is fine when you burn your opponent out in the next few turns, but less so in more conventional control decks. Big priest fairs well with the card, but with barnes rotating you may see less of that too (hopefully). Priest will need another explosive win con to properly make use of this card, ideally one not as cancerous as the aforementioned decks. Hands down, best AOE card in the game. Flamestrike, Hellfire, Brawl, Enter the Coliseum, Twisting Nether, DOOM!, Doom Pact, Excavated Evil, Holy Nova, Dragonfire Potion, Lightbomb, Swipe, Consecration, Blade Flurry, Lightning Storm, Explosive Trap, Spirit Lash, Doomsayer, Ysera Awakens, Anomalus, Blizzard, Starfall, Deathwing, Poison Seeds, Shadow Word: Horror, King Mosh, Shadowreaper Anduin, Corrupting Mist, Fatespinner, Death and Decay, and anything else I forgot -- good, but not perfect against N'Zoth, the Corruptor or Bloodreaver Gul'dan. Wild Pyromancer + Equality or Equality + Consecration is excellent, but still allows for deathrattle effects while also making your own minions vulnerable. Not to mention leaving divine shield minions alive. A Zombeast that deals damage to all other minions while being poisonous -- again, ignores divine shield and sticky deathrattles come again, able to kill that Zombeast. Also very hard to obtain. Vanish comes closest to disrupting the pummeling of aggro, but still leaves you vulnerable to good topdeck draw. 2+ Shadowboxers, 1+ Elixir of Life, heal a character -- while this may not completely remove deathrattle minions, it does (if played at the right time) kill your opponent's hero while restoring yours to full health simultaneously. In other words, Reno Jackson + C'Thun for 9 mana compared to 16. In Wild only. Mass Dispel followed by Dragonfire Potion or Lightbomb. Only works in Wild, however, and your opponent's board may not fit the AOE description completely. The Kazakus Potion (10 mana) that first polymorphs your enemy's board and then deals 6 damage to them all. This is still Standard, but the chance of getting both Mystic Wool and Felbloom (or any 2 specific potions for 10 mana) is only 20%, and in most cases you would be fine with just Mystic Wool and, say, Ichor of Undeath. Which still leaves your opponent 7 points of damage with 7 beasts, who can be buffed. See https://hearthstoneplayers.com/detailed-look-kazakus-potions-synergies/ for more detail. Furthermore, Psychic Scream prevents application of Rhok'delar and To My Side! in Spell Hunter, Raza the Chained / Kazakus / Reno Jackson in Highlander Priest, and among other things, basically wrecks your opponent's topdeck draw. Some strong examples are putting 7 Mana Treants in their deck without killing them, leaving them with far less mana, and (after killing the Voidlords) putting a bunch of Voidwalkers in their deck. Of course, it's not perfect. If you remove N'Zoth, the Corruptor or Hadronox for example, you just postpone the army. 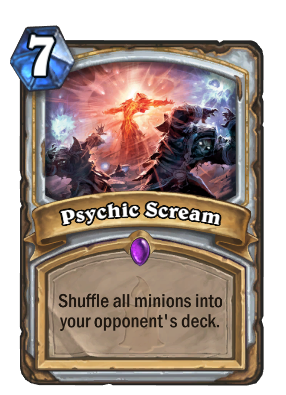 But as a control card, especially against aggro and control decks that rely on many weak minions or deathrattle minions respectively, Psychic Scream is OP. Essential in Control Priest, especially Highlander/Razakus/Razanduin/Reno Priest. Thank you Blizzard, for giving us yet another means of board clear. So I had a wonderful debate about this card on its reveal. Personally didnt think it would change much. Well after a month of its release this op/meme card hasn't seen any legend rank love. It hasn't stormed the meta and oppressively shut down the a majority of the decks out there. The fear this card instilled has yet to come to light (or spread it's darkness). Again community hype vs current meta shows that you can't always predict how a single card will effect the game. But I myself am working on a meme deck for it, just need a little more dust and a bit of luck. you know you are talking about one of the best Aoe in the game and it is played in almost every raza priest deck? You mean RIP Raza. Spellhunter isn't as memey as Raza is. Why did they print this. This is horrible to play against. Under no circumstances did priest need this card, nor anyone.